Deb's Cup of Tea: TWO! Yesterday was a bad day. I awoke with a headache. I cannot tell you the last time that's happened. Since starting this regimen of drugs for RA, I rarely get headaches. No stress headaches. No tension headaches. Whatever would cause those things seems to be either kept in check or abated since adding RA drugs to my life. So, waking up with a monster headache, actually, having the headache wake me up, another rarity, was strange. I've been having a bit of an RA flare since coming home from vacation. I'm pretty sure it was a result of the long distance and the lack of cruise control on the rental car. We stopped frequently, but it wasn't enough. My right eye has been red, a sure sign of a flare, since midday on Tuesday, and really goopy, proof of a flare. I know how to handle that, warm compresses over my eyes and sterile eye drops, but it takes time, once I'm in a full-blown flare, to get it under control. My sleep gets disrupted, too. But, thanks to the physical therapy, my sciatica is nowhere to be seen. That, alone, makes handling a flare easier. I even mowed the lawn in one sitting on Sunday, 45 minutes. After I did that, I spent 2.5 hours in the recliner with my feet up. But this headache... There is a perfect Yiddish word for this, "Oy". I had breakfast and took a shower but the warmth of the water and steam didn't make it go away. I warmed a wash cloth and lie down on the bed, with it over my face. I lay as long as I could, grabbed left over spaghetti for lunch, and headed to the office. One aspirin and an allergy pill later, it seemed to abate, but it was never gone. I also found myself dozing off frequently throughout the day. It was a bad Monday. And then I came home. Look! The prairie flowers that I have at the southeast corner of the yard are in full bloom. I will take a photo tonight when I get home. The purple coneflowers and black-eyed susans are beautiful this year. Maybe it was all the rain? 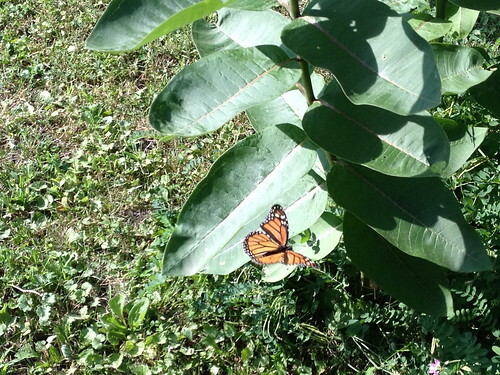 And you know I don't mow off the common milkweed that grows in my yard unless it's really not in a good spot. I've actually mowed around 5 plants in the front yard. 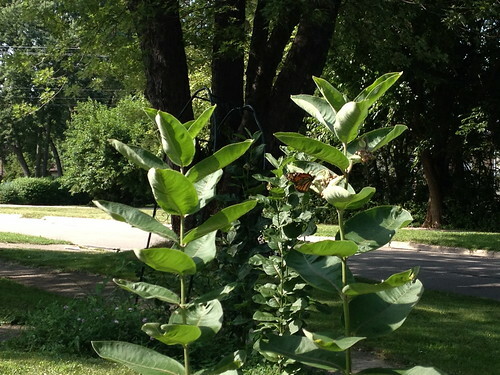 They look kind of silly but I want them to grow specifically for monarchs. There were actually two monarchs in this patch. Such joy! I sat in my driveway and tried to capture their swirling dance around each other as they flitted through the plants. Later, as I watered the flowers on the deck, one came around, probably looking for water in the birdbath. It was so dirty that I had dumped it out in the morning and hadn't refilled the bowl. This makes me so happy. I wish I could find a cocoon. I would photograph the heck out of that. I've never seen one and it's obvious I've got something of a habitat for them. As monarchs are endangered, this brings me a great deal of happiness. Last Wednesday, a perky young woman stopped by my house to offer me bug killing services. "We'll rid your yard and house of bugs and spiders," she said enthusiastically. I was shocked. She couldn't guarantee that beneficial insects, such as my monarchs, wouldn't be harmed when their pesticide was applied. Why, on earth, do people want sterile yards? She gave me some clap trap about how spiders only remove 1% of the bugs in your yard. But they, and the bugs I see around me, are part of a broader ecosystem. If we remove the bugs, then there's nothing for birds. She couldn't or wouldn't, give me the scientific proof that spiders only eat 1% of bugs and she was stumped when I said, "Then there's nothing for birds or bats to eat." And, when I pointed out that you cannot completely eradicate bugs because your neighbor's property may not be sprayed, she said, "Well, we just spray everyone then and it all works out." No. No. No. It doesn't work like that. When she told me I was wrong for wanting spiders in my yard, I told her to get off my property and take her pesticide with her. I may have said, "And get a real job where you're not lying to people" as she walked away. I'm right. We're all connected. I thought about the neighbor who wants no bugs. No butterflies? No moths? No ladybugs? No dances of orange wings on a Monday afternoon. I don't get it, but maybe I'm weird. My headache didn't go away and I wound up going to bed early and sleeping for 10 hours. I feel fine today. I hope the butterflies are back. I really want to capture the joy in watching them fly. That's happiness.